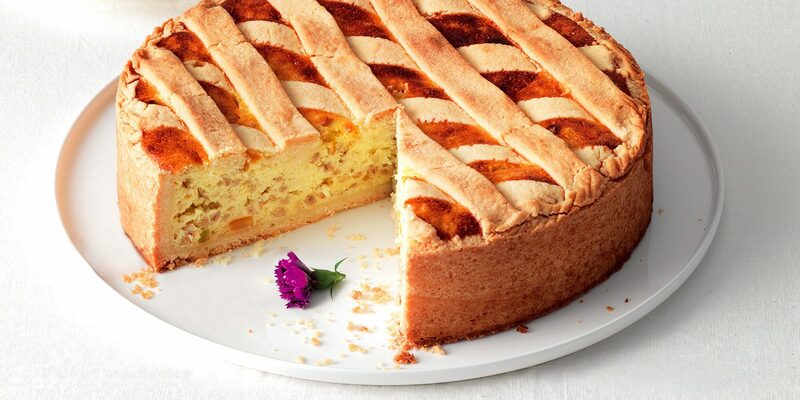 As we are getting in the Easter spirit for the upcoming holiday, the featured recipe of the week is Pastiera Napoletana. We sell the Grano Cotto (cooked wheatberries) needed for this recipe at the deli. Continue reading to follow the recipe for this delicious Neopolitian wheatberry and ricotta Easter cake! First, soak the wheat in water to cover overnight, if possible. The next day, start with the Pasta Frolla, combine the dry ingredients in a food processor and pulse to mix. Cut the stick of butter into eight pieces and add them to the mixture, then pulse to mix in finely. Add the eggs and pulse until the dough forms into a ball, then remove it from the bowl, and wrap and chill the dough. Next, drain the wheat and place in a pan with salt and water to cover by three or four inches and simmer until tender for about two hours. Add the water as necessary to keep it from drying out and sticking, then refrigerate until needed. For the pastry cream, combine the sugar and flour in a small, non-reactive saucepan. Stir well to mix and add the milk in slowly, whisking it in smoothly, then whisk in the egg. Cook over low heat and continuously stir until the pastry cream thickens and comes to a boil. Boil while stirring vigorously for about 30 seconds, then remove from heat and stir in vanilla. Scrape the pastry cream into a clean bowl, cover with plastic wrap, and chill. For the filling, add the ricotta to a mixing bowl and stir the cooled pastry cream to make a smooth, creamy mixture. Stir in the sugar, eggs, and remaining ingredients, then stir in the cooked wheatberries. Now it’s time for the oven! Preheat your oven to 350 degrees, and set a rack in the lowes level. Butter a 9-inch cake pan that is 2 inches deep. Cut off ⅓ of the Pasta Frolla and set it aside, then roll the remaining ⅔ of the dough into a 14-inch disk and line the prepared pan with it, allowing the dough to hang over the edge. Pour in the filling and sprinkle it with cinnamon. Then, roll the ⅓ of dough into a 10-inch square, and cut it into ten 1-inch wide strips. Paint the strips with egg wash. Moisten the rim of the dough on the pan with the egg wash, and adhere five strips in each direction, forming a diagonal lattice. Trim away any excess dough even with the top of the pan and push the dough all around off the top rim of the pan so that it is completely within the pan. Bake for about 45 minutes, or until the filling is set and the pastry is a light golden color. Let it cool in the pan before unmolding. Serve the Pastiera at room temperature, and enjoy! This entry was posted on Wednesday, April 3rd, 2019	at 8:44 pm	and is filed under Recipes	. You can follow any responses to this entry through the RSS 2.0	feed. Both comments and pings are currently closed.